At the Beacon Theatre yesterday (April 10), the show came to town, and drew families – naturally including my own – who left with city-block smiles on their faces. In a word, the show, which draws on existing episodes, expands them, and sets them to new, original music numbers, was a joy. The performers are all solid in their vocal skills and manage to stay in the background (intentionally) as they’re wearing all black while navigating life-size puppets (they’re on stage much like the Avenue Q performers — but thankfully without the debauchery). 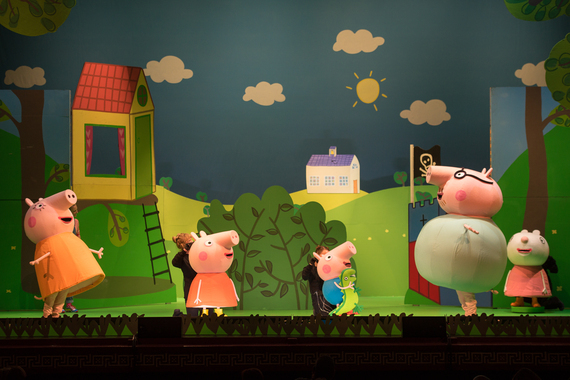 Overall, Peppa Pig’s Big Splash expands on a truly wonderful cartoon, and serves as a lovely gateway to Broadway. I can’t wait to take my family back to the land of muddy puddles next time they hit the states. For now, we’ve got the series on DVR. Many. Episodes.